Rather unbelievably, I’m not going to go into a quadrants discussion here. Wow. But check out “Only if the Behavior Decreases” if you want to address the question of whether yelling can be punishment. Instead, I’d like to talk about what I do regarding yelling. I’m human. Even if I don’t intend to, sometimes I yell. I won’t argue that I can’t help it, but it would be very hard to change the behavior of yelling as a response to being startled. And it is a functional response, so one that I might not want to try to get rid of (as difficult as that would be). I have certainly done the “startled yell” at my dogs. If a dog is sitting right next to me and suddenly leaps up and barks in my ear, I am going to be startled and likely yell. Likewise, if I am tired and strung out (trigger stacking) and one of them does something that provokes me, let’s just say that I may not speak in my nicest voice. Knowing that about myself, I took a simple action. Once the dog is learning that my saying “Hey!” predicts a treat, I raise the volume gradually, then raise the stress in my voice. The end result is that I can yell, “Hey!” in the meanest voice I can muster and my dogs turn to me or come running happily. I do the same thing with each dog’s name. I say it in all different tones of voice, pairing it with something great. I’m not a big yeller, but conditioning “Hey!” and the dog’s name seems to spread nicely to other things I might yell as well. Thorough readers of my blog will have noticed by now that I have classically conditioned a fair number of things. All of these things started off as pure classical conditioning, but, as is typical, the operant behaviors started piling on and getting reinforced. And they are good behaviors! Reorienting to me, even running to me when the event happens if the dog is a distance away. All these things that are classically conditioned potentially turn into recall cues/positive interrupters. But we always need to think these things through. 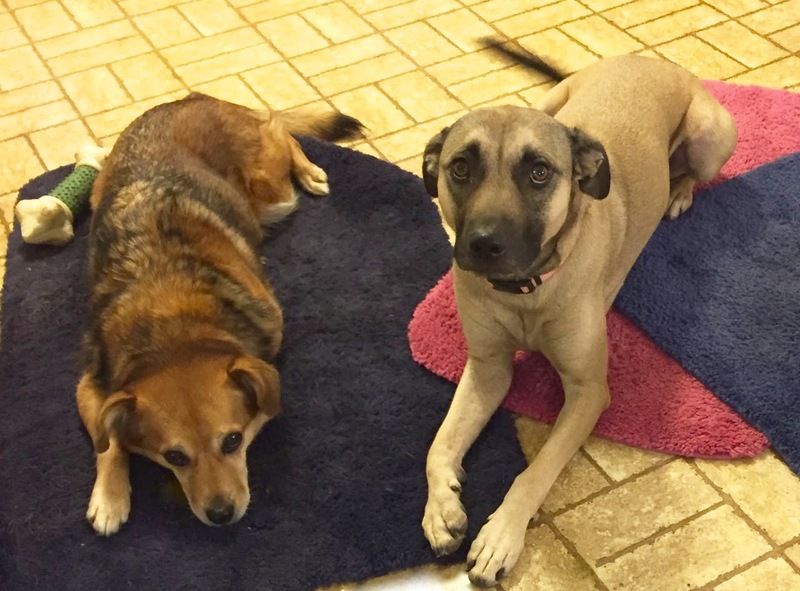 All these recall cues presuppose that the triggers will happen in situations where it is both desirable and safe for my dogs to come running to me. Frankly I am rarely in situations where that would not be safe. Areas where my dogs might be off leash, however large, are generally enclosed or not in a busy area. However, there’s always that horrifying possibility that my dog might get loose and see me from across a busy street or a similar hazard. That’s the one type of situation when I don’t want my dog to come running to me. For that reason, I also teach my dogs a distance down by hand signal and vocal cue. It means to drop right where they are. That reminds me, I should practice that some more. Here’s an older post with a video where you can see some practice though: Safety behaviors: Down at a Distance and Recalls. Lots of people defend yelling at their dogs in a disciplinary way. They feel they need their dogs’ respect or need to convey to their dogs that what they are doing at times is “unacceptable.” But we need to be honest. If those methods reliably work to interrupt and lessen (punish) behavior, it’s because there is a threat. Yelling by itself, beyond the startle effect, is not that potent of a punisher to an adult dog. That’s why people who yell in an attempt to interrupt or change their dogs’ behavior tend to keep yelling and yelling. If we let go of the idea of trying to prove to our dogs that they are being “bad” and look at how to interrupt the behavior, a positive interrupter is a great way to go. Want to see what happens when I yell, “Hey!” at my dogs? But won’t interrupting my dogs when they are doing an undesired behavior, then giving them a treat, indirectly reward those behaviors they are performing when interrupted? Won’t I get more obnoxious behavior? If that were the only time I reinforced my dogs’ behavior, I might have something to worry about. But my dogs earn reinforcers all day long doing things I like. And I catch them being good far more than I interrupt them doing stuff I don’t like. The Matching Law is on my side. I’m not going to have a huge upsurge of barking in my ear or fence running or bullying another dog. My dogs can get my attention and earn a treat a lot more easily than that! I can truly say that yelling is not a punishment, or even particularly unpleasant, for my dogs. If you condition yelling, it can be just another strange noise in their life that predicts good things. Here’s the unedited original. I hadn’t yelled. 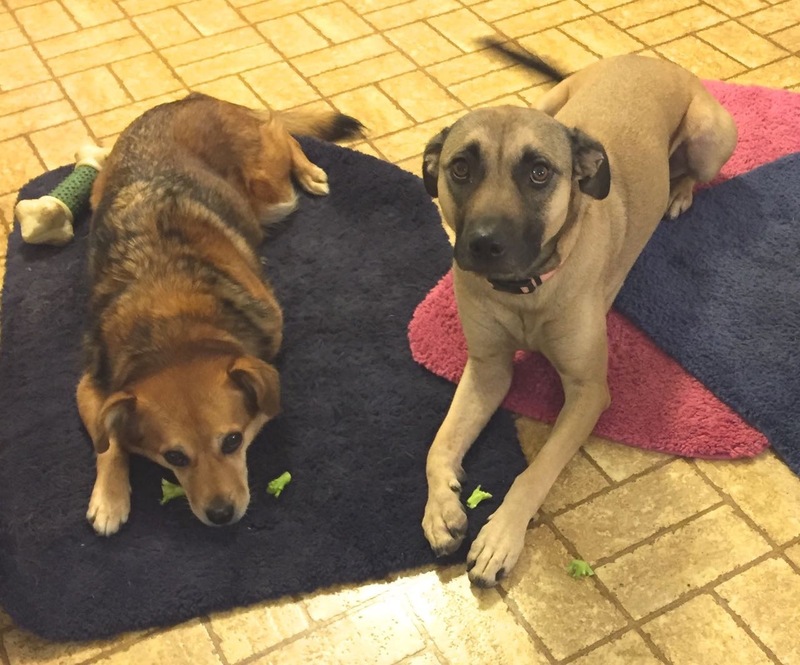 I had given them broccoli, and they were extremely disappointed. I’m so mean! I’m a PPG member and FB friends with many of yours. Just saw this blog (and now I’m reading others) and wanted to thank you for this one in particular. I lived with a dog that barked her head off and my go-to response was always a loud “Hey!”. However, I never conditioned her to the word as you have discussed here. I’m ashamed to admit that I never even thought to do it! But what a great idea. I’ll never forget to do this again, or to teach it to my clients who love to yell. I just sent you a FB friend request. Hopefully you’ll accept it. And I recently bought your book on CCD. Thank you so much for your kind words, Francine. All these hints we pass along to each other end up enriching out animals’ lives, and our own of course! I have recently adopted Newfie that BARKS LOUDLY at all motorcycles and bikes!!! Can’t tell you how awful this is! I am going to try your “hey!” Method as he just may be the perfect candidate for this… It’s an interesting approach Thanks! That would be tough with a Newfie for sure! Good luck and thanks for the comment. I’ve never yelled at a human in my life, but on occasion I do yell at my dogs. Usually to try and get their attention if they start fighting. Then they go right in their crates so we can all calm down. This may happen once a month, and I feel bad, but it gets their attention enough that I can split them up myself.